In my spring 2014 FCIL research seminar, I explored the idea of using documentaries to provide a visual representation of unfamiliar legal systems. 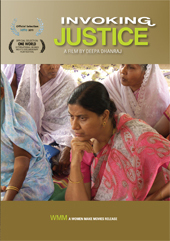 One of the films that I chose to screen was Deepa Dhanraj’s 2011 documentary, Invoking Justice. The film was very well received by the students and led to several interesting group discussions, both during class time and on the course website. Student feedback strongly suggested that they found the film enjoyable, that it helped them to understand how religious (and, to an extent, customary and mixed) legal systems work, and that it encouraged them to think about how one might research legal issues or handle cases arising under these systems. The film suggests, though not overtly, that the women’s Jamaat functions not only as a tribunal, but also as an enforcement mechanism and advocacy organization. Its members are shown approaching male Jamaat members to questions their tribunals’ decisions and processes, and using the police force to compel male defendants to attend women’s Jamaat sessions when they do not take the tribunal seriously. Dhanraj follows several of the Jamaat’s cases from beginning to end, which helps to unify the film and provides a narrative element. The film also portrays the power that comes with open communication; the women’s Jamaat has been a galvanizing force for women in the region, and groups of women are shown in animated discussions of topics that would previously have been considered taboo in a public forum. Invoking Justice is entertaining and visually appealing, and provides an excellent insight into how one form of local tribunal might operate. It also illuminates substantive issues relating to family law and women’s human rights under religious and customary law systems, and addresses issues of discrimination not only in the law itself, but in the procedural practices of the tribunals, the application of the law, and the enforcement of the tribunals’ judgments. Because there is no prerequisite to my FCIL research seminar, I have found that, by necessity, it must serve as a crash course in international law and world legal systems in addition to developing the students’ research skills. Having searched for a film that would entertain the students while at the same time illustrating the issues surrounding religious law, customary law, and informal tribunals, I found that Invoking Justice was an excellent choice. Invoking Justice is distributed by Women Make Movies and can be purchased from their website. My study guide for the film is available online through SlideShare.